Join the discussion on our forums! Come discuss Kindly Grandmother over in our dedicated Kindly Grandmother discussion topic. So he is definitely a worgen, so why the beast tag? 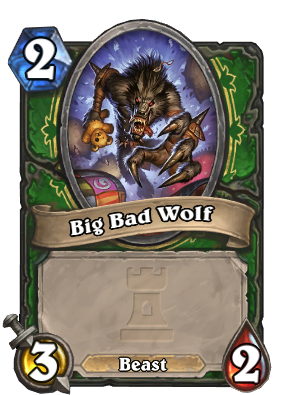 Neither form should have it, as they are categorized as humanoids, and this can be seen in all other worgen cards. This card has won me so many games. Best hunter card imho! Best attack sound in the game. The golden animation of this card looks so badass. I don't know what this Faeria is, but if you think that any CCG will not be decided on a diceroll of getting or not getting that card you need at that exact moment you need it, you're going to be sorely disappointed. Also, there's nothing wrong with the design of sticky minions. 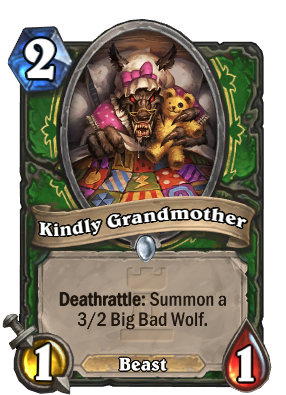 why does granny have a teddy bear? its a reference to an old fairy tale told in germany and in holland. its a wolf that disguises itself as a grandma to eat red riding hood. that still doesn't explain the teddy bear. Nerubian Egg is back! Though, stat trade of for the Beast kin label. Which is just a major win for Hunters. Honestly, why don't they learn. Abusive Sergeant is probably the highest neutral value minion in the game now post ONiK, if there was any doubt earlier.